Arizona Congressman Trent Franks' Bill of Rights tweet had some problems. 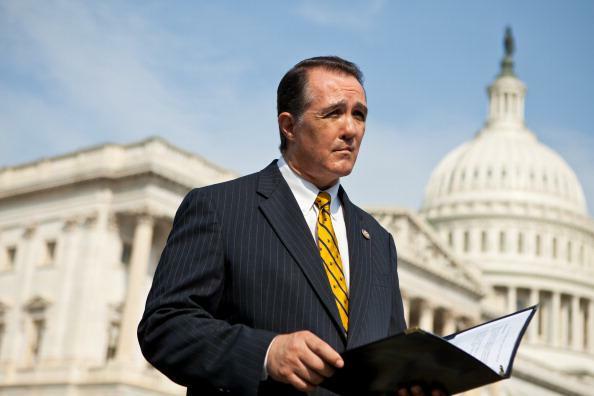 Trent Franks on Capitol Hill in 2011. It was 1791, not 1971, obviously. The way you can tell this is that the actual Bill of Rights is a piece of paper rather than an eight-minute drum solo (the primary form of communication in the United States in 1971 was eight-minute drum solos). The Bill of Rights wasn’t “founded.” It was ratified. Now, every time I write a post criticizing a public figure for demonstrating a Neanderthal-level command of written English, people pop up on Twitter to say that I’m being annoying and pedantic. But jiminy Christmas, we’re talking about high-ranking elected officials. Talking and writing about matters of public concern is literally their Only Job. Learn the damn difference between founding and ratifying. Trent Franks once appeared on a panel (at an event run by extremist anti-Muslim paranoiac David Horowitz) with a lunatic named Robert Spencer who said that President Obama is “likely” a “secret Muslim.” Franks, shaking his head sadly, agreed with Spencer that at the very least Obama acts like a secret Muslim. Hysterically interpreting the existence of non-Christian religions as a threat to the United States equals First Amendment reading comprehension fail. Just another day in the ol’ USA (est. 1964). Zeppelin rules.